Virgin Voyages, formerly Virgin Cruises, has unveiled its plans for a new terminal at PortMiami. Sir Richard Branson's cruise line said in a press release that the new Virgin Voyages Terminal will be located on the northwest side of the port in Miami, giving it incredible views of the city’s skyline. Construction is due to start next year and will be completed by November 2021, the beginning of the year’s cruise season. The design is inspired by Miami Beach’s iconic palm trees and the island’s historical origins as an area intended for harvesting coconuts. 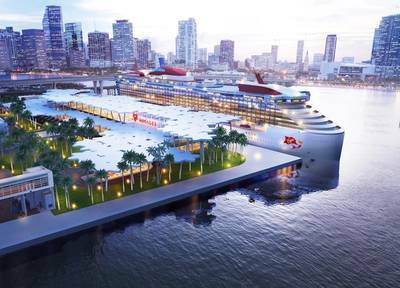 The rooftop is designed to resemble a palm tree grove, with rooftop pockets that will allow natural light to flow into the building by day and uplighting by night that will light up the company’s iconic Virgin Voyages red logo and allow the terminal to shine bright, mirroring the skyline. “South Florida is our home, and with our fleet now growing to four ships, we’re humbled and thankful to soon have a gorgeous new terminal overlooking the Miami skyline, an incredible view that will set the stage for the alluring journey that we will take our sailors on,” said Virgin Voyages CEO Tom McAlpin.